Production Company: Vitagraph Company of America. Director: Lawrence Trimble. Writer: Marguerite Andrews. Cast: Tom Powers (the young millionaire), Charles Kent (Mr. Wescott, as an old man), Courtenay Foote (Mr. Wescott, as a young man), Florence E. Turner (Primrose), Leo Delaney (the artist). Transfer Note: Copied at 16 frames per second from a 35mm tinted nitrate print preserved by UCLA Film & Television Archive. Running Time: 16 minutes (silent, no music). Promoted with the slogan, “Life is full of strange coincidences,” A Window on Washington Park tells the story of a young millionaire who takes pity on a tattered old man sitting alone in the park outside his window. Inviting the stranger in to share a meal, the youth listens to the old man’s tragic tale and makes an unexpected connection that heals a long-time family rift and brings a happy ending. The melodrama features Florence Turner, “The Vitagraph Girl,” as the old man’s ill-fated daughter, the lovely Primrose. Often considered America’s first movie star, Turner appeared in 1907 in her first film at Vitagraph, where she worked not only as an actress, but also as a bookkeeper, pay clerk, accountant, and wardrobe woman. She is thought to be the first American film actress ever signed to a contract and the first to make personal appearances, reportedly causing riots in 1910 as fans crowded into New York theaters to see “The Vitagraph Girl” in person. Turner left Vitagraph in 1913 soon after the release of A Window on Washington Park. Relocating to England for several years with her director Lawrence Trimble and co-star Tom Powers, she started Turner Films. Although she was popular in Britain on both the stage and screen, she never recaptured her earlier success in the United States and was relegated to minor roles. Trimble, on the other hand, went on to direct films for Universal. Powers enjoyed a career resurgence in the late 1940s after his appearance as Barbara Stanwyck’s doomed husband in Billy Wilder’s Double Indemnity (1944). 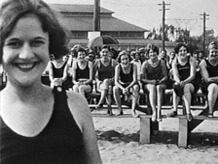 This film was preserved under the direction of UCLA Film & Television Archive from a nitrate print discovered in 2010 at the New Zealand Film Archive. With support from the NFPF, the 35mm tinted print was scanned at a high resolution and output to 35mm polyester film stock at Colorlab.